Gwilym Prichard spent a lifetime capturing the coastlines and countryside of Wales , shunning the celebrated view and instead seeking out the secluded spot, the timeworn rock or weather-beaten cliff. Together with the figurative artist Claudia Williams, he embarked on a creative journey that spanned seven decades. The couple married in 1954 and worked alongside each other, their enduring partnership becoming the subject of several radio and television documentaries. 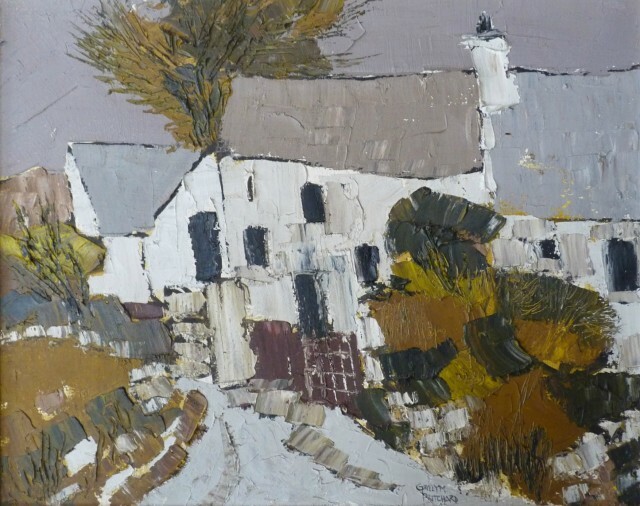 Gwilym's oil paintings, gouaches, watercolours, pastels and mixed media compositions chart the career of a man who, in his own words, did not set out to be an artist but who invigorated British landscape painting through his particular brand of observation and understanding. I paint the land and farms, the sea and sky because they shaped my life, he once said. Gwilym described his approach as emotional rather than analytical. While his earliest paintings were formal interpretations of his environment, he soon arrived at an intimate response to his subjects. Even when a finished work tended towards abstraction, he insisted it must have its foundation in reality, and that it must not be so far removed as to have lost the first inspiration. Arts Council of Wales; Contemporary Art Society of Wales; Government Art Collection; National Library of Wales; University of Wales, Aberystwyth; University of Wales, Bangor.